Most golfers warm up for their round, and practice, on the greens by hitting 15-20 foot putts. I have a sense that many do this because they believe this is the best way to determine the speed of the greens that day. Practicing mid-range putts has little benefits. If you miss a 15-20 footer do you get feedback? Of course not! Even tour pros miss more 15-20 footers than they make. It is more beneficial to work on speed control without hitting to a hole in the putting green. Set up an alignment stick, or 5-iron, on the green 90 degrees from your approximate target line. Set up golf balls at 3, 7, 11, 15 and 19-feet, and beyond if you desire. Try to hit each ball as close to the stick as possible without hitting the stick. This will be more of a test than rolling 20 footers towards a hole. Another drill is to putt to a quarter on the green. Try to stop the golf ball on the quarter. This drill is a great way to determine whether your misses are because of a bad read, poor speed, or inability to get the golf ball started on line chosen. Both of the drills mentioned are harder than hitting towards a hole, because many golfers do not decide how hard they will attempt to hit the ball before they pick a starting line of the putt. The first task to improve feel is to work on speed control, but we must start by visualizing the entire roll of the putt desired. Most of us see the line to the hole, but if this is the case we must decide on a line where the ball will take its last roll into the hole. Before picking a line we must decide the distance the ball will travel. Putts with more than a couple inches of break, in one direction, can have multiple lines to choose from, and also different speeds that the ball will go in the hole. There is not one perfect line for many putts. For our best chance to make a putt the speed and line need to come close to matching. When reading a putt we must first determine how far we want to hit the putt. Two considerations must be involved in this decision: how far am I willing to hit it past the hole? And what speed gives me the biggest window to make the putt? By “biggest window” I mean the line that allows us to not hit the perfect putt, and the putt to still go in. After we consider those two factors we can pick a desired speed. After a speed is determined, we then can pick an intended line that best matches the speed. If the speed desired requires us to hit the putt 14 inches past the hole, we must focus on putting the ball the full length of the desired roll. If the putt breaks right, the point picked would be past the hole, and to the right of the hole. The most important part of this whole process it to then putt to the end point of the visualized line, not the hole. If you hit the golf ball to the point you picked, with the speed you desired, and read the putt well enough, it will go in the hole. However, hitting the putt with the focus being 14 inches by the hole gives a better chance to hit a good putt. 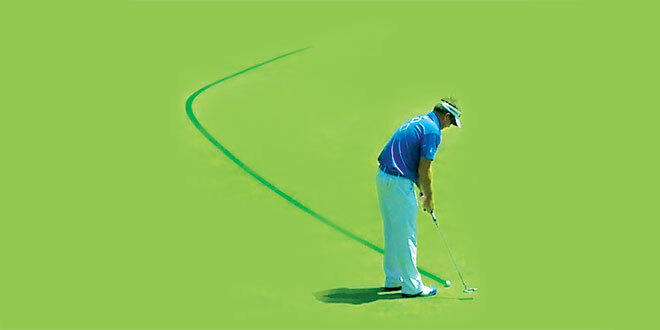 The photo included with this column illustrates how on TV, they typically show a line that gives the break of the putt, but the line stops in the hole. On TV, the break is always shown to the hole – but what if the best desired line is to hit the ball slightly past the hole? If we change the end point of the desired roll of the putt, that would change the line, of course! If you want to make more putts, a desired speed must be chosen first. An end point must be determined based on the distance you want to make the ball travel, and the break you conclude will happen at that speed. You must putt to stop the ball on the end point, because this will help you hit the putt the correct speed. I would suggest having an end point past the hole on many of your putts. For more help with developing the skill of feel on the greens, and how to pick a line that matches the speed desired, go see your local PGA professional. Todd Elliott is the PGA Head Golf Professional for Hideaway Beach. Todd is TPI (Titleist Performance Institute) Certified as a golf professional. This gives him the ability to give golf specific physical screening to detect any physical limitation that might affect the golf swing. Todd is also a Coutour-certified putting fitter, a Titlteist-certified fitter and a Titliest staff member. Follow Todd on Twitter @elliottgolfpro or for any question or comments email telliott@hideawaybeachclub.org.